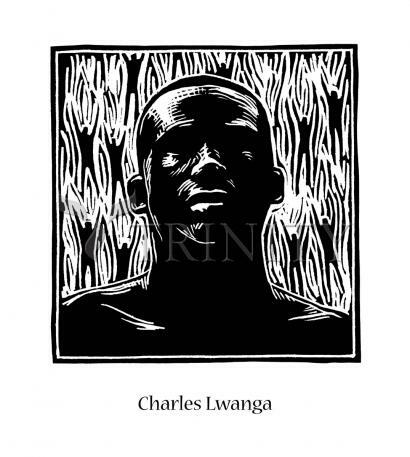 Charles Lwanga, a convert to Christianity in 1885, was one of the Martyrs of Uganda. Most of the twenty-two who have been proclaimed saints were burned to death on June 3, 1886, after being forced to walk thirty-seven miles to the execution site. Their remarkable courage in the face of horrible brutality echoes the faith of the early Christian martyrs. "A well that has many sources never runs dry. When we are gone, others will come after us." Charles Lwanga was a Ganda who belonged to the Bush-Buck (ngabi) clan. However, members of this clan were debarred by custom from the royal presence, and when Lwanga took service at court he passed as a member of the Colobus Monkey clan, that of his former master and patron. His father and mother are said to have been Musazi and Meme and it has been claimed that he was born in Ssingo County, and was a younger brother of his fellow martyr, Noe Mawaggali. Whatever the truth of this claim, it is certain that, at a very early age, he was sent to Buddu in the south west to be brought up by Kaddu whom some believed to be his biological father, but who may have been an uncle. Like Kaddu, his coloring was chestnut brown. On the accession of King Mwanga in 1884, Lwanga went to the court and entered the royal service. His personality was such that he was at once placed in charge of the royal pages in the great audience hall, immediately winning the confidence and affection of his charges. Lwanga also excelled at wrestling which was the most popular sport at the palace. His immediate superior, the future martyr Joseph Mukasa, came to rely more and more completely on Lwanga for the instruction and guidance of the royal pages and for shielding them from the evil influences at court. Lwanga was also made overseer of the excavation of the so-called Kabaka's (King's) Lake, at the foot of Rubaga Hill. On November 15, 1885, the day of Joseph Mukasa's martyrdom, Lwanga and some other royal servants, whose lives were in danger because they were catechumens, went to the Catholic Mission and were baptized by Father Simeon Lourdel. The following day, the king assembled all the pages and demanded under pain of death that they confess their Christian allegiance. All of them, Catholic and Anglican, except for three, did so. Mwanga was baffled by the solidarity and constancy of the young Christians, but hesitated to carry out his threat to kill them all. Several times in early December the king attempted to intimidate his pages, in spite of visits from the Catholic and Anglican missionaries. On one occasion, Lwanga exclaimed that, so far from helping the white men to take over the kingdom, he was ready to lay down his life for the king. After the fire in the royal palace on February 22, 1886, Mwanga moved the court temporarily to his hunting lodge at Munyonyo on the shore of Lake Victoria. Here Lwanga continued to protect the pages from the King's homosexual advances and to prepare them for possible martyrdom. By this time, Mwanga had obtained the consent of his chiefs for a massacre of the Christians. Meanwhile, Lwanga himself baptized five of the most promising catechumens. On May 26, watched by Lourdel, the pages entered the royal courtyard to receive judgement. Once again, they were called upon to confess their faith. This they did, declaring that they were ready to die rather than to deny it. Mwanga ordered them all, sixteen Catholics and ten Anglicans, to be burnt alive at Namugongo. Once again, they passed the desolate Lourdel, waiting in vain for an audience. He noted how tightly they were bound, but more especially their calmness and even joyful disposition in the face of death. The martyrs were taken from Munyonyo to Mengo and from thence on the eight mile journey to the execution place of Namugongo. On arrival, they were kept in confinement for a week. Preparations for the execution pyre were not completed until June 2. During that time the martyrs prayed and sang together, while the missionaries, both Catholic and Anglican, conferred among themselves and paid fruitless visits to the king to appeal for their young neophytes. On June 3rd, before killing the main body of prisoners, the executioners put Charles Lwanga to death on a small pyre on the hill above the execution place. He was wrapped in a reed mat, with a slave yoke on his neck, but he was allowed to arrange the pyre himself. To make him suffer the more, the fire was first lit under his feet and legs. These were burnt to charred bones before the flames were allowed to reach the rest of his body. Taunted by the executioner, Charles replied: "You are burning me, but it is as if you are pouring water over my body." He then remained quietly praying. Just before the end, he cried out in a loud voice "Katonda,"--"My God." After his death, the main holocaust then took place further down the hill. Charles Lwanga was declared "Blessed" along with twenty-one other martyrs by Pope Benedict XV in 1920. All twenty-two were proclaimed canonized saints by Pope Paul VI in 1964. In 1969, Paul VI laid the foundation stone of the Catholic shrine at Namugongo on the place of Saint Charles Lwanga's martyrdom. This shrine was dedicated on June 3, 1975, by a specially appointed papal legate, Cardinal Sergio Pignedoli.